One of the most commonly asked questions when getting started with e-textiles is "How many LEDs can I put in my project?" In this guide, we will cover conductive thread's resistance and how that affects powering LEDs, calculations to predict battery and power requirements, and some construction tips. If any of the following topics sound unfamiliar to you, we recommend checking out the corresponding tutorial before continuing. One of the most important things to consider when building a wearable project is the resistance of conductive thread. 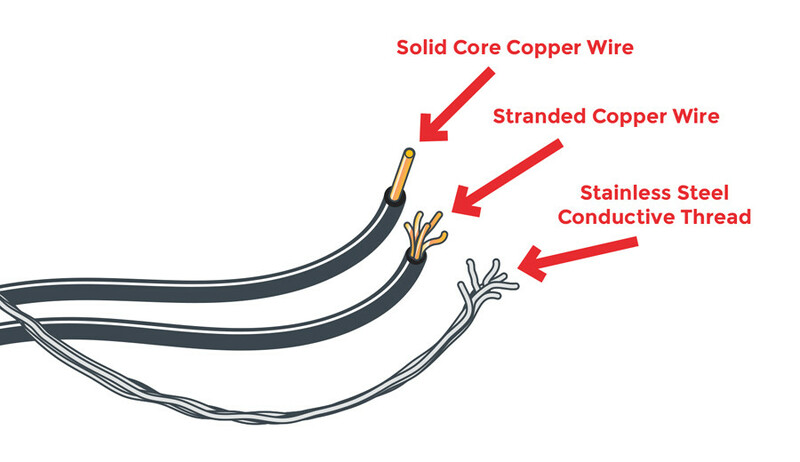 Unlike copper wire, which has very little resistance, conductive thread's resistance will vary depending on the metal used to make the thread and the thickness of the thread. Most conductive threads list resistance in Ohms/Ft. The lower this number is, the better, because less resistance means more electricity can get through to the components used in your project. The basic electrical property Ohm’s Law states that running an electrical current through a material high in resistance causes the voltage to drop. The higher the current, the greater the voltage drop. This means that even though a LiPo battery powering your LilyPad may put out 3.7 volts, by the time it gets through the thread to your components, it may drop to 3.0 volts or less. Many electrical components, such as LEDs, need a certain voltage to function properly. For example, in a project with LilyPad LEDs if the voltage drops below 3 volts, a blue LED will stop working, followed by the green and finally the red. To get full-color output from RGB LEDs like the LilyPad RGB LED Board, you should always try to run at 3 volts or above. To figure out an LED's voltage needs, you can take a look at the forward voltage section of the LED's datasheet. Check out this tutorial for more detailed instructions on how to read an LED's datasheet. You can create your own low resistance traces using thin strips of conductive fabric. We recommend using iron-on adhesive to attach to fabric or ribbon, then using conductive thread to hand stitch components to the traces. To figure out how long your project will run on battery power, you need to know two things: how much current your project uses and the capacity of your battery. You can measure exactly how much current your project uses by measuring it with a multimeter, but we can also make a pretty accurate guess by looking at the LED datasheets and doing some math. A single LilyPad Pixel Board will use 40mA when it’s set to white (all three internal LEDs fully on). For a worst-case estimate, you could multiply that by the number of pixels in your project. However, you’ll probably be displaying different colors on your LilyPad Pixel Boards and turning them off entirely at times. The resistance in the threads will also drop the voltage, meaning the LilyPixels will run slightly dimmer and use less current. Usually, it’s safe to halve the above estimate, which gives us 20mA. For more detailed information on working with LilyPad Pixel Boards, take a look at our LilyPad Pixel Board Hookup Guide. Now, let’s look at the battery. Battery capacity is given in milliamp-hours (mAh). This number tells you how many milli-amps (mA) a full battery can provide for one hour before it’s empty. The e-Textiles Battery that comes with most LilyPad Arduino kits has a 110mAh capacity. 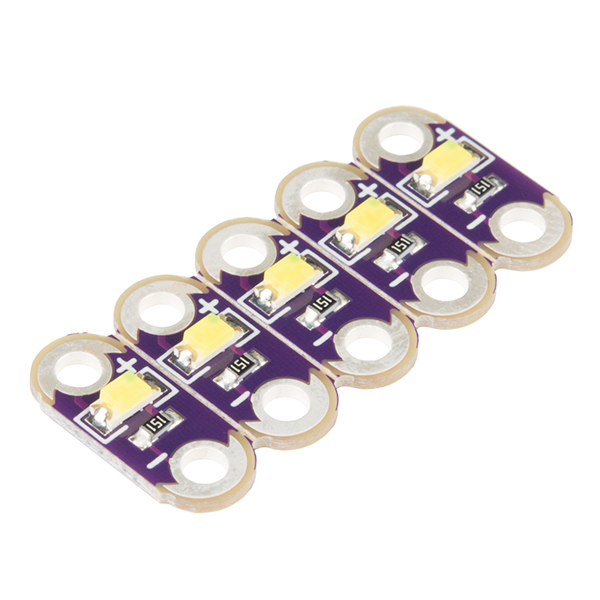 For many projects, especially ones with a large number of LEDs, you will probably want to use a higher capacity battery for a longer run time. The other batteries in our catalog are not created especially for e-Textiles. Use caution to avoid shorting out conductive thread traces when using alternative batteries.